Background: Parkinson’s disease (PD) is the subject of intense efforts to develop strategies that slow down or stop disease progression and disability. Substantial evidence points to a prominent role for neuroinflammation in the underlying dopaminergic cell death. Ultramicronized palmitoylethanolamide (um-PEA) is well-known for its ability to promote the resolution of neuroinflammation and exert neuroprotection. This study was designed to assess the efficacy of um-PEA as adjuvant therapy in patients with advanced PD. Method: Thirty PD patients receiving levodopa were included in the study. The revised- Movement Disorder Society/Unified Parkinson’s Disease Rating Scale (MDS-UPDRS) questionnaire was used to assess motor and non-motor symptoms. 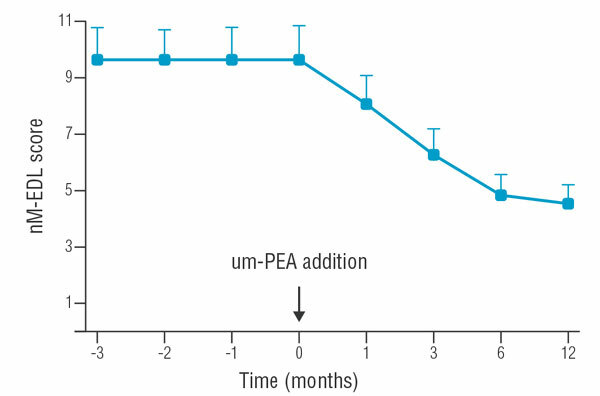 Clinical assessments were carried out before and after addition of um-PEA (600 mg). MDS-UPDRS questionnaire total score for parts I, II, III, and IV was analyzed using the Generalized Linear Mixed Model, followed by the Wilcoxon signed-rank test to evaluate the difference of each item’s mean score between baseline and end of um-PEA treatment. Adjuvant therapy, motor and non motor symptoms, neurodegeneration, neuroinflammation, Parkinson&apos;s disease, ultra-micronized palmitoylethanolamide.